- What is Anaerobic Digestion? - What goes into the Biogas plant as feedstock? - What comes out of the process? 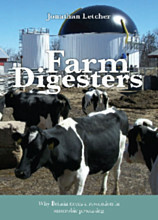 - Is Biogas Renewable Energy? - Is Biogas Technology sustainable? The feedstock is a waste product which would otherwise be dumped in landfill sites, which can produce methane, adding to global warming, and liquids which pollute waterways. The bio-fertiliser can be used on soil to displace chemical products and this completes the life cycle of plants growing in soil, being processed, sold, becoming biowaste and finally returning to the soil as a valuable nutrient. - Does the process reduce the mass of the waste? - How can AD help Council's achieve government Best Value objectives? In December 2002 the Minister for the Environment, Michael Meacher, agreed in principle that Biogas Technology/Anaerobic Digestion should be re-classified within the definition of BV82b (Composting). This means that every tonne of waste processed in a Biogas Plant will now contribute towards Best Value targets within this category. - Where does it stand in the waste hierarchy of Reduce, Recycle, Compost, Recovery, Disposal? - Can Biogas Technology help with Legislative targets for Councils? - Is the technology proven? - Is it commercially viable? Biogas plants are a more sophisticated method of waste disposal which of course require more capital investment than transporting waste to landfill. 25% of the income for a plant comes from energy, (covering the running costs) and the remaining 75% from Gate Fee for organic wastes. Rising landfill taxes and the increasing value of gas are all improving the commercial case for building AD plant. AD plant is being built in the UK in 2006 on a fully commercial basis without any government subsidy. - Is a Biogas Plant safe? - What can Biogas be used for? - What can the Bio-fertiliser be used for? For local Councils, biodigestion has proven an excellent way of meeting liabilities over government targets. Engineering costs prove greater value as these are directed toward funding actual construction and not into consultants and middle men's pockets.